I got asked so much about this that I just had to put together a blog post with an overview of natural laundry detergent options. 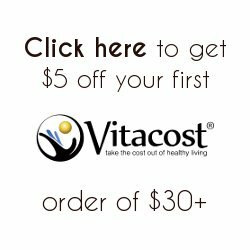 Have you wanted to try out a more natural laundry solution but did not know where to start? Do you have sensitivities in you family, but are afraid that moving away from your current detergent would leave you with stained, dingy clothes? Go to Olga’s Laundry Blog to read the full post. I personally have owned condenser dryers my whole life – growing up in Europe clothes dryers in general were difficult to come by, and vented options were pretty much unheard of, so condensers were the only option. Now that I’m in the US I opted for a condenser because we live in a condo with no dedicated laundry room, just a small closet in the bathroom. It’s really a great option for those who, like us, don’t have the space but want to be able to do laundry. At the same time condenser dryers need maintenance that differs from what you would be doing with a vented dryer. I put together a step-by-step photo tutorial over on Olga’s Laundry Blog for anyone who wants to know how exactly how to access and wash the condenser part, and how frequently this needs to be done. Persil ProClean Now Available in Canada! One of my Canadian readers, Shalryn, just recently complained that she had searched left and right for Persil ProClean in Canada, only to find out that it was only available in the US. I made sure to add a note about that in my blog post so that wouldn’t happen to anyone else. Well guess what, that has just changed! Persil ProClean is now available in Canada, and their lineup even features an exclusive Persil Coldwater formula that is not currently sold in the US. Have you ever gotten black shoe polish on your clothes and wondered what to do with it and whether the clothes could be salvaged? My husband recently came home with a shoe polish stain on the cuff of his white dress shirt and asked me if anything could be done to remove that. Laundry challenge accepted! Over on Olga’s Laundry Blog I’ve posted a tutorial on how to deal with such stains and some before and after photos of the shirt, so click the link below to check it out. Some people REALLY don’t like to sort their laundry. In fact, in a recent WSJ article some laundry detergent manufacturers claimed that detergent formulas and washing machine programs were evolving as more men were doing their own laundry. And according to their studies the vast majority of men do not like to sort clothes before they go into the washing machine. I am not a man. I am also somebody who religiously sorts their laundry by both color and fabric type. Nonetheless, despite not being the target audience for Shout Color Catchers I decided to give them a try and see if they really do what the package claims and keep your whites white even in mixed loads. Head on over to Olga’s Laundry Blog to see how they performed and whether they stood up to the bold claim of “mix whites and colors in the same load” (which assumes that your whites will come out of the wash non-dingy). I’m actually super excited to announce the first ever laundry giveaway on http://olgaslaundry.com! Head on over to the blog to read my review of Persil ProClean 2in1 and enter a giveaway – you can win one of three coupons for a free bottle of Persil ProClean laundry detergent. This giveaway is open to US residents ages 18 and up only. I have owned my Miele W3038 washer for about 18 months now, and at a rate of 7-10 loads of laundry per week I can definitely say that I’ve put it through some rigorous testing. I summarized all my experiences in a lengthy review that just went live on Olga’s Laundry Blog – click here to check it out! If you’re thinking of buying the Miele W3038, if you are generally researching compact front loaders, or if you are a laundry nerd like me you should find it interesting. And when I say “epic”, I really do mean it – the review got so long that I ended up needing to add a table of contents! Head on over to Olga’s Laundry Blog for all the details. A lot of people don’t realize that most down garments do not require dry cleaning and can be washed at home in a regular washer. In fact, if I could get a quarter every time somebody tells me how brave I am to be wearing a white down jacket, I’d be pretty rich by now! They are usually shocked to find out that the jacket in the photo above is actually over 3 years old, and has managed to stay white with just 1-2 washes per season. 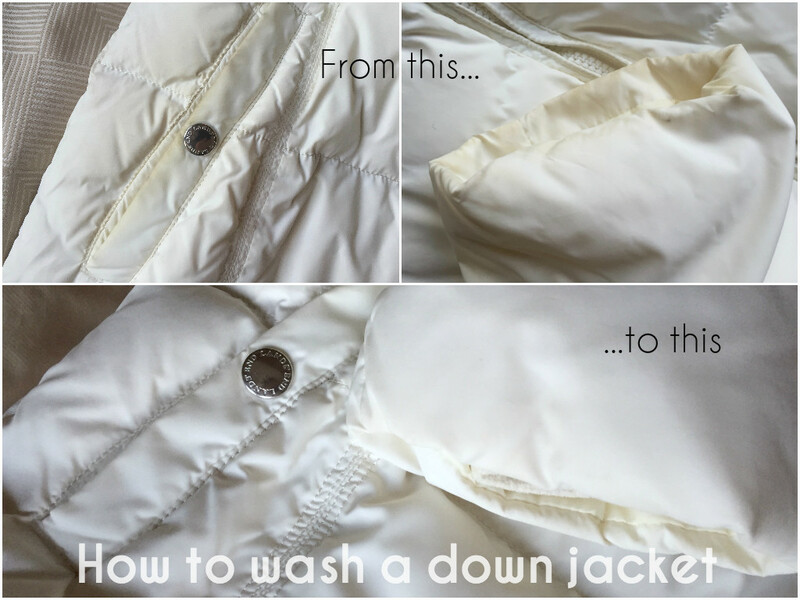 If you’ve never washed down and are not sure how exactly to do that without damaging the garment, head on over to Olga’s Laundry Blog to read my post on how to wash a down jacket. Holiday Gift Ideas for Laundry Lovers! This is what happens when you start Christmas shopping early! I don’t know about you guys, but I’m very much in the holiday mood already. 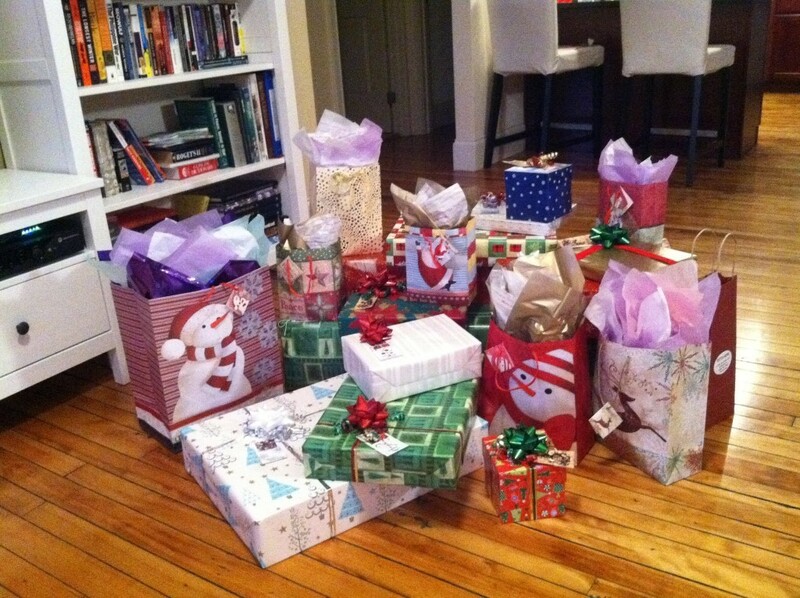 In fact, every year I start shopping for gifts at some point around October, which means that by the time Christmas comes around I already have a nice big pile of gifts waiting to be wrapped. Best of all – no last minute stress shopping with the crowds! Since I’m thinking about gifts a lot, and since laundry is always on my mind I figured that it would be a good idea to put together a list of holiday laundry-themed gift ideas. If you have a laundry lover on your list, look no further than Olga’s Laundry Blog! Click here to go to the full list. 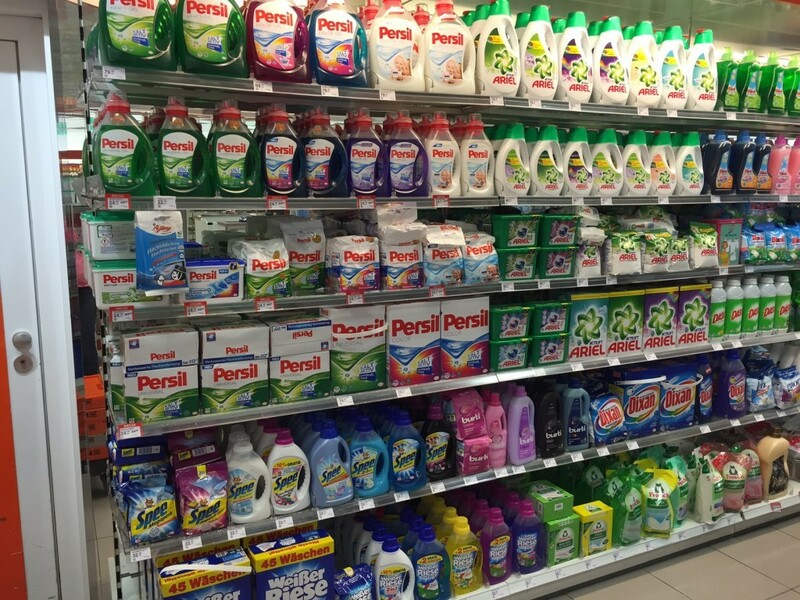 The detergent aisle of Mueller in Zagreb – such splendor! Am I the only person who actually gets excited about laundry shopping on vacation? When we went on our honeymoon in Japan I spent quite a bit of time reading about Japanese laundry detergents. And of course I brought back several packs of detergents to try at home. And when we recently went to visit my beloved Croatia I had so. much. fun. shopping for European detergents there! 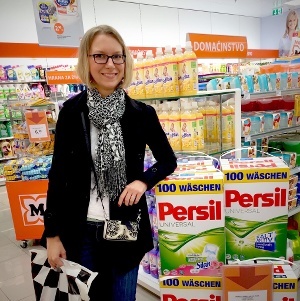 Head over to Olga’s Laundry Blog to read about laundry detergent shopping in Europe.